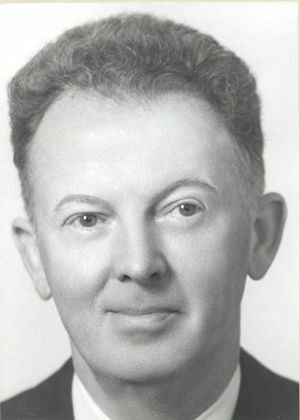 Arthur V. Loughren, IRE President, 1956, directed the research about color television at Hazeltine Corporation, and his findings became a part of the National Television System Committee’s standards for color television. Arthur V. Loughren was born in 1902 in Rensselaer, New York. He graduated from Columbia University, New York, in 1925 with a degree in electrical engineering. After graduating, he worked first at General Electric and then at RCA. The bulk of Loughren’s career was spent at Hazeltine Corporation, which he joined in 1936. During World War II he was active in the development of IFF equipment for the U.S. Navy. After the war, Loughren directed Hazeltine’s research on color television. The research resulted in the development of the constant luminance principle, the shunted monochrome design of both the transmitter and receiver, and the concept that the color television system was not sequential. These developments became basic features of the NTSC standards for color television, which were adopted by the U.S. Federal Communications Commission in 1953 and are still in use. Loughren was a fellow of the Institute of Radio Engineers, the American Institute of Electrical Engineers, the Society of Motion Picture and Television Engineers and the Radio Club of America. He served as IRE president in 1956. He received numerous awards, including the David Sarnoff Gold Medal from the SMPTE and the Morris N. Liebmann Memorial Award from the IRE. Loghren was married to Midge Hansen. He died, at age 91, at his home in Kailua-Kona, Hawaii. This page was last edited on 18 January 2016, at 18:06.